Flight 427 was approaching Pittsburgh runway 28R when ATC reported traffic in the area, which was confirmed in sight by the first officer. At that moment the aircraft was levelling of at 6000 feet (speed 190 kts) and rolling out of a 15deg left turn (roll rate 2deg/sec) with flaps at 1, the gear still retracted and autopilot and auto throttle systems engaged. The aircraft then suddenly entered the wake vortex of a Delta Airlines Boeing 727 that preceded it by approx. 69 seconds (4,2 miles). Over the next 3 seconds the aircraft rolled left to approx. 18deg of bank. The autopilot attempted to initiate a roll back to the right as the aircraft went in and out of a wake vortex core, resulting in two loud "thumps". The first officer then manually overrode the autopilot without disengaging it by putting in a large right-wheel command at a rate of 150deg/second. The airplane started rolling back to the right at an acceleration that peaked 36deg/sec, but the aircraft never reached a wings level attitude. At 19:03:01 the aircraft's heading slewed suddenly and dramatically to the left (full left rudder deflection). Within a second of the yaw onset the roll attitude suddenly began to increase to the left, reaching 30deg. The aircraft pitched down, continuing to roll through 55deg left bank. At 19:03:07 the pitch attitude approached -20deg, the left bank increased to 70deg and the descent rate reached 3600f/min. At this point, the aircraft stalled. Left roll and yaw continued, and the aircraft rolled through inverted flight as the nose reached 90deg down, approx. 3600 feet above the ground. The 737 continued to roll, but the nose began to rise. At 2000 feet above the ground the aircraft's attitude passed 40deg nose low and 15deg left bank. The left roll hesitated briefly, but continued and the nose again dropped. The plane descended fast and impacted the ground nose first at 261 knots in an 80deg nose down, 60deg left bank attitude and with significant sideslip. 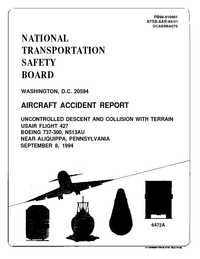 PROBABLE CAUSE :" The National Transportation Safety Board determines that the probable cause of the USAir flight 427 accident was a loss of control of the airplane resulting from the movement of the rudder surface to its blow down limit. The rudder surface most likely deflected in a direction opposite to that commanded by the pilots as a result of a jam of the main rudder power control unit servo valve secondary slide to the servo valve housing offset from its neutral position and over travel of the primary slide." Distance from Chicago-O'Hare International Airport, IL to Pittsburgh International Airport, PA as the crow flies is 658 km (411 miles).